We never encountered the animal, but I knew him through his work. Steve stopped the truck on a wooden bridge near where the beaver had damned the water in the creek again. It was likely that Forest Service employees had reversed his efforts a few weeks earlier — we had seen the free-flowing water and wondered if employees had also relocated the beaver. The amount of fresh-cut branches piled near the road indicated the little landscape engineer was still alive and well. I had read somewhere that the beaver was second only to humans in its ability to change environments. 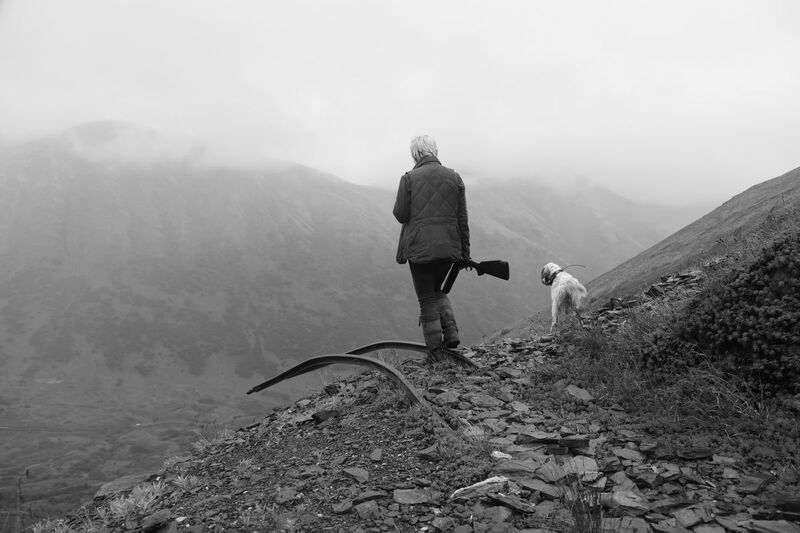 A few weeks after the grouse season opened, we had headed for the mountains with dog and shotgun on every day our schedules allowed. On this day, the valley ahead of us was dull with a mist that promised damp boots and lower temperatures once we climbed into the rocks. We planned to take a trail that led to an abandoned gold mine. We had only visited the peaks and lakes beyond it in the winter, and I was excited to see the lake without snow. Hugo, a 4-year-old English setter, ran ahead and left the trail. In less than an hour, the long zigs and zags of the miner's trail ended at the mine. The path was so distinctively a miner's — different from the trails made by game, hunters, or hikers — and it evoked the history of mining in the area. As we walked, we noticed the wreckage of the mine as it spilled down the mountain. The scraps of rusted metal and gray logs left an impermanent record of the passage of time. I imagined the labor that went into each scrap compared to the sweep of an avalanche that laid it to waste. Just as vanishing glaciers had left their mark in the rocks, the remains of the mine gave me a lonely feeling and reminded me of the beaver's work at the creek. Steve mentioned that he didn't view the metal and wood as litter, perhaps because it had a historic quality. The trail resembled my thoughts — a long and straight progression in one direction followed by a turn in the opposite direction for an equal length. It was as if I was arguing against the gold miner in one stretch and in favor of the passion he had for his work in the next. I thought how he must have loved the view each morning. I pictured him taking a rare break from his dark work inside the mountain to peer out across the valley. "I think I see a black bear," I told Steve. The black shape high on the mountainside across the valley didn't move, and I took out my binoculars. It wasn't a black bear but a mine shaft of a different vintage. The trail to it had long since vanished. It seemed the mountains were always devolving and evolving so that at no time were they ever complete or incomplete but a constant living work unto themselves. When we reached the mine, we found a memorial to the man who loved it. He was a temporary visitor, like us. It was a good place for a break before we continued past where the trail ended, but it was a sad place. or at least it seemed so in the mist with the fractured debris of the old mine splintered around us. Above us, rail tracks stuck out of the mountain. They had broken off and arced out into the space below as if the imagined cart of gold would be delivered into emptiness. For many years, I wondered about the connection between ptarmigan and gold country. In our search for ptarmigan we had followed many trails made by prospectors. There was also the legend about finding gold in the crops of ptarmigan. It made sense because the birds require grit for their digestion, and gold sparkles. I knew a hunter who claimed to "mine" a hundred ptarmigan crops — the internal pouch where a bird stores excess food for later digestion — without success. Still, I pondered the similarities between gold seekers and hunters. In some ways, we were both after a public resource. In other ways, the value of what we were after was different. The value of gold is not intrinsic, whereas the value of a bird is part of the life cycle. Too much thinking, I thought. Hugo shivered, and we released him to ascend into the rocks where he might find birds. He found a merlin but not ptarmigan. We walked the highest field of rocks and watched as Hugo descended into another valley. This one was quieter, and I struggled to understand why. It seemed that maybe it had less exposure to the collective memories of hikers and miners than the previous valley, braided with trails and history. This one appeared wilder, less examined. There was no twisted metal or traces of the Kenai Peninsula gold rush. The sound of ptarmigan echoed from down in the creek bed, but I could not tell from where it came. The wind was strong as it swept across the top of the mountain. And the air was so heavy with mist on the edges where Hugo searched that he never found the birds. After an hour, our hands were numb from cold, and we turned back. This time I noticed the lime green of the moss that grew verdant where water seeped from the rocks. In a faster current or dryer light, it would not appear so lush. The mountain seemed to glow at the moment, and each raw thing of beauty was rare for being such a mixture of place and time. We came to hunt birds, but like the miner, our fever had more to do with a pursuit than with fortune. At the truck, we dried off Hugo and put away our wet guns and gear. Steve stopped on the bridge where the beaver worked and looked for him again, as he always did. I felt I understood, just for a moment, how the mountain remembered its visitors.